← Those Russians have always been known for their sophisticated approach to humour! Several years ago a friend was extolling the virtues of a then new TV series on HBO called THE SOPRANOS. At first I thought there was some musical connection. After it was explained to me that the show was about a small time mob family in Jersey, I sort of rolled my eyes. Oh boy…here we go again. Let me guess they are of Sicilian descent and they unceremoniously execute anyone that gets in the way of their “family business”. At first I thought, “what a worn out stereotypical pile of crap”. I could accept the Godfather trilogy as great art though I saw that as the perpetuation of italian negatives to an unsophisticated populace. Years later I had an epiphany. OK…surely most “thinking” people realize that all Italians and Italian-Americans are not criminals. SOme are..yes indeed, but of course the vast majority are good civil law abiding folks. My father and his family was from Sicily. My mother’s family was from Naples. I guess I might be a bit more sensitive than some about the whole “mobster” thing and it’s connected glorification of violence. Then one day I sat down and watched an episode of THE SOPRANOS. It was engaging…it was frightening but most of all I found it downright HYSTERICAL. That’s right…FUNNY.Thought these men were portrayed as unfeeling, violent psychopaths, they were also portrayed as frail and flawed human beings in many ways. So much so that I found myself laughing out loud at their neuroses and manias. With each show the insane behaviour escalated. I thought I would wet myself when Joe Pantaliano’s head appeared in the bowling bag. With each new season I found myself getting sucked deeper and deeper into the black hole. Ehhhh, once you’re in the family you can never get out, right? My attitude completely changed from one of dismissal to one of admiration for the writing and acting on the show by all involved and particularly the male lead. 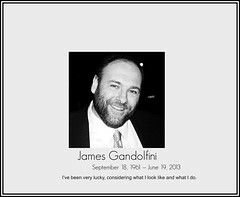 This sets the background for the passing of the main male lead in the show…James Gandolfini. Until THE SOPRANOS, I had never heard of this actor. Since the show’s end I had have the pleasure of watching his work in other productions. I believe his performance as Tony Soprano may have been one of the single greatest acting accomplishments in TV history. So real, so believeable, so flawed, so lost in his own illusions of what life should and could be. He did a most incredible portrayal. RIP Mr. Gandolfini. You have left us way too soon. One can only imagine the great work you might have done in the future. This entry was posted in TV and tagged HBO, Italian American, James Gandolfini, Jersey, Sicily, Soprano, Television program, The Godfather, the mob, The Sopranos, Tony Soprano. Bookmark the permalink.